Welcome to our February newsletter. You probably can see that our newsletter looks a little different than before. That’s because we’ve redesigned our website. There are new graphics, a updated layout and some fresh content in addition to the features that were popular. Be sure to check it out at www.binleyflorist.com. We’ve added a new feature to our newsletter; we call it “Dot’s Spot”. Dot Eggleston, our garden manager will be posting a few notes about what’s happening in the garden division, so look over our shoulder as we go through the seasons. I’ve included a short article about Valentine’s Day trends that I hope you find helpful and a column from “USA Today” to help get you into a gardening state of mind. If you’ve driven by our store in January you probably noticed a mention of “Nakamas” and you probably asked yourself, “What the heck is that?” I’ve got an answer for you. We’ve got lots to cover in this issue, so let’s get started. Our Fall Festival has come and gone. I hope you were able to get here for the fun. The weather was perfect; just cool enough to remind you that fall was here and warm enough to make the day enjoyable. This year’s crowd was the largest yet. Our parking lot was filled and the lot at CWI next door was too. This year we had 40 vendors, covering a wide variety of interests, from jewelry to sign makers to a photographer. Our friends from Parkland Alpaca Farm were here with two animals. We had chair massages, North Country Wild Life and SPCA of Upstate NY (with puppies and kittens). Did I mention a troupe of belly dancers? We had them too. Created on 05 November 2012 . It’s been an interesting growing season this year. Hot and dry early, with the fall trying to make up the rain shortfall. 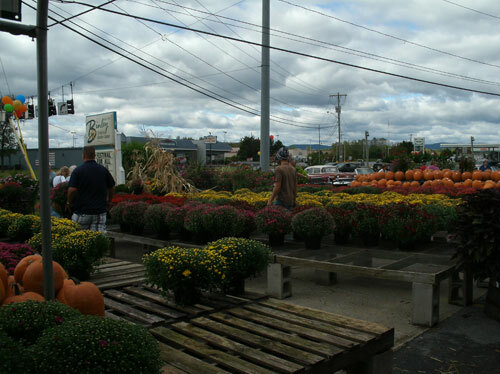 The warm late summer weather helped us to produce huge mums with enough rain and mild weather to extend the annuals. With the Thanksgiving / Christmas seasons just ahead I’m looking back on our Fall Festival and forward to our newest arrival, mulch. Our Christmas trees and greens are scheduled to arrive around Thanksgiving and inside our store we’ve begun the change-over to the holidays. I’ll post some history and care of Christmas trees on our website, so look for that in December. On the subject of Christmas, I’m rerunning an article from last year on care of poinsettias. Join us on Sat. September 15 from 9:30 AM to 4 PM for our 6th annual Fall Festival. WCKM's morning crew, Pete and Dan will be broadcasting live from 10 to 1. This year we've got something for everyone. The SPCA of Upstate NY will be here with pets for adoption. Also our friends from the Parkland Alpaca Farm will be here with some animals. The Valley Road Maple Farm will be here with syrup, maple cotton candy and other maple products. New this year is Meme’s Snack Shack, Roger’s Dessert Cart, custom Wood Signs Woodcraft, locally grown produce plus many more. Come and see live birds of prey brought by North Country Wild Care. The NYS Police will be here at 10 AM & 1 PM with a canine demo. There'll be local crafters, some that have not been here before, vintage cars, belly dancers, a dunk tank fund-raiser for SPCA and chair massages from The Massage Works. Created on 30 August 2012 . It's always busy around here in May and June, but this year was really special; we were chosen to receive two awards. In May the Post-Star's reader's "Best of the Region" survey named Binleys as the area's favorite florist and garden center. 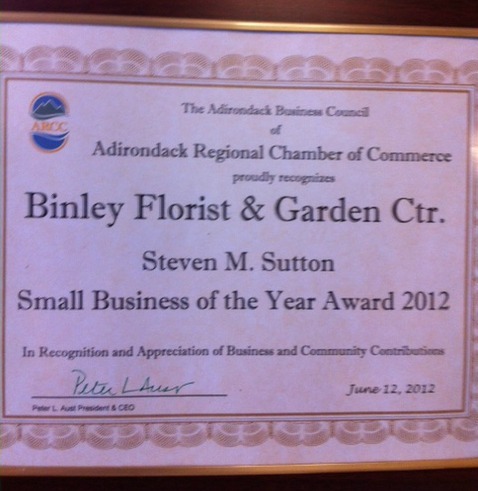 The Adirondack Regional Chamber of Commerce in early June, awarded Binleys the "Steven Sutton Business of the Year". This was awarded based upon various criteria and judged by a committee of Chamber members. I want to thank all who nominated and voted for Binleys and mostly to our staff, who enjoy what they do and belive in customer service.